Buckeye Valley’s Alaina Radcliffe soars toward the hoop during the first half of Wednesday’s MOAC showdown against visiting Highland. 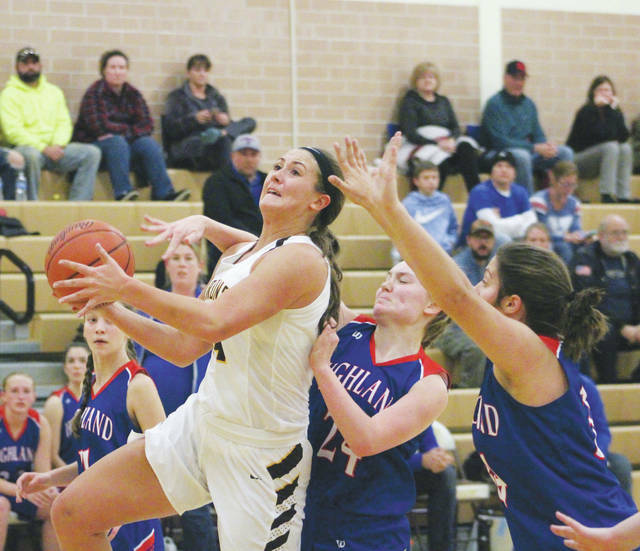 Senior Alaina Radcliffe scored eight of her game-high 19 points during a 10-0 run in the first quarter to lead the Buckeye Valley girls basketball team to a 55-42 non-league victory over visiting Highland Wednesday night in Delaware. Madison Cecil’s three-pointer gave the Scots an early 3-1 lead in the opening frame. Lisa Leienberger tied it on BV’s next possession and Radcliffe followed with an and-1 conversion, a three-pointer and a lay-in on consecutive possessions to push the lead to 11-3. “We really preach the intangible side of things — the things that require zero talent — and I think (Radcliffe) has done a great job with that,” BV coach Travis Stout said. The Barons, who led 35-16 at the half, pushed the lead as high as 21 twice in the third quarter. Morgan Scowden and Dani Grether had eight points apiece for the Barons (2-2), who snapped a two-game skid. Erica Sardinha and Kenzie Fuller each knocked down three-pointers to get the Scots within 41-28 late in the frame, but a Reilly Taylor basket and two Hannah Cowan free throws pushed it back up to 17. Sardinha’s basket cut the Highland deficit to 45-30 through three. She hit her second three-pointer of the game to get the Scots as close as 12 in the fourth quarter. Cecil finished with 14 points to lead the Scots (1-3) and Sardinha added 12. BV returns to MOAC action Saturday night at 7:30 p.m. when it hosts Ontario. https://www.delgazette.com/wp-content/uploads/sites/40/2017/12/web1_rad.jpgBuckeye Valley’s Alaina Radcliffe soars toward the hoop during the first half of Wednesday’s MOAC showdown against visiting Highland.